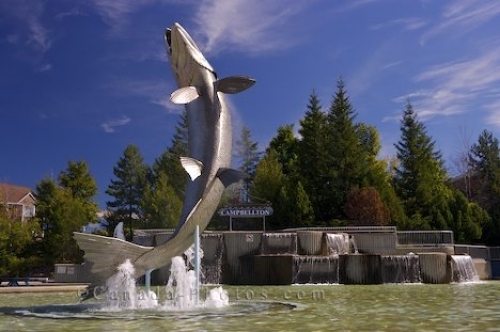 In the center of the town of Campbellton, New Brunswick a large Atlantic Salmon monument is displayed in the fountain. An Atlantic Salmon named Restigouche Sam symbolizes what the town of Campbellton, New Brunswick means to the many fisherman who visit this town for the great fishing. This monument stands in the fountain at a height of 8.5 meters as Campbellton is the capital of salmon fishing. Monument of an Atlantic Salmon (8.5 metres high) named Restigouche Sam, along the waterfront of the Restigouche River in the town of Campbellton, Appalachian Range Route, Highway 11, Restigouche, New Brunswick, Canada. Picture of an Atlantic Salmon monument in the town of Campellton, New Brunswick.